Pro Vice-Chancellor (Research) Laurent Rivory, Professor Chris Maher, Professor Jane Latimer, Professor Joel Negin, Professor Cathie Sherrington, Professor Andrew Lachlan. 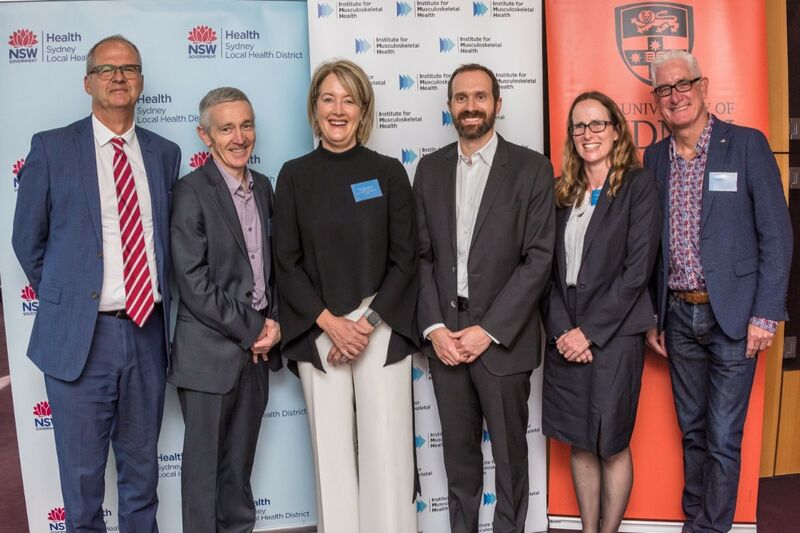 A research collaboration dedicated to improving the lives of patients with musculoskeletal conditions, and promoting physical activity for older people and people with a disability, has been launched in Sydney. The Institute for Musculoskeletal Health brings together leading researchers and clinicians from the University of Sydney and Sydney Local Health District to develop innovative solutions to combat the growing burden of musculoskeletal disease and physical inactivity in Australia and around the world. The Institute is led by international leaders in musculoskeletal health, with the executive team comprising Professor Chris Maher, Professor Jane Latimer and Professor Cathie Sherrington from the University of Sydney’s School of Public Health and Dr Bethan Richards, Head of the Department of Rheumatology at Royal Prince Alfred Hospital. Poor musculoskeletal health is the most common reason for Australians to access healthcare services, and costs the economy more than $55 billion in direct health costs, loss of productivity and burden of disease. There are more than 150 forms of musculoskeletal conditions, including back pain and back problems, osteoarthritis, rheumatoid arthritis, osteoporosis and juvenile arthritis. This burden of musculoskeletal conditions will increase in coming decades with an ageing population. By 2023, it is estimated that the number of cases will increase by 43 percent to 8.7 million Australians – or more than 30 percent of the population. The same pattern will occur with inactivity as older people are the most inactive segment of society. At present about one in two Australians are physically inactive, and this figure will increase substantially with an ageing population. The University of Sydney’s Deputy Vice-Chancellor (Research) Professor Duncan Ivison said the Institute has already managed to secure $32 million in National Health and Medical Research Council (NHMRC) funding and appointed more than 110 staff and affiliates. “We are committed to developing the innovative solutions required to reduce the growing burden of musculoskeletal disease and physical inactivity in Australia and around the world,” he said. Sydney Local Health District Chief Executive Dr Teresa Anderson AM said the Institute formalises the longstanding relationship between healthcare researchers and frontline clinicians, which has already produced world-leading research, including a 2018 series in The Lancet. This collaboration revealed a global epidemic of inappropriate tests and treatments for back pain, such as imaging, opioids and surgery, highlighting the extent to which musculoskeletal conditions are mistreated, often against best practice treatment guidelines. “Our partnership provides a platform to strengthen clinician-researcher alliances and improve the translation of research into the community,” Dr Anderson said. Professor Chris Maher said: “We’re very excited about the launch of the Institute and the outstanding research opportunities this partnership provides. “To reduce the global burden of musculoskeletal disease, the Institute will promote translational research, foster the development of a highly skilled musculoskeletal research workforce, and contribute to developing sustainable, equitable, and cost-effective health care services. “Our researchers will improve the management of musculoskeletal conditions by testing treatments to establish if they are safe and effective. We’ll work with our clinical colleagues to translate this evidence into practice so patients get the best care possible. “As the musculoskeletal system thrives on physical activity, the Institute has a strong line of research looking at how we can use physical activity and exercise to improve people’s well-being and function across the lifespan – children, middle-aged workers, retirees, people with a disability. The Institute’s team of researchers and clinicians come from a variety of backgrounds including medicine, allied health, nursing and pharmacy and health promotion, and all bring extensive experience in planning, designing and conducting clinical research. Currently, the Institute is investigating whether taking a short course of oxycodone reduces pain severity in acute back or neck pain compared to placebo (the OPAL trial). In 2018, the PRECISE trial examined the efficacy and safety of pregabalin in sciatica and provided unequivocal evidence against its use. The trial was a finalist for Trial of the Year by the Australian Clinical Trials Alliance and the results were published in the New England Journal of Medicine. The official launch of the Institute took place on February 8, 2019 at the Kerry Packer Education Centre at Royal Prince Alfred Hospital.